A new tradition was started in October 1998 with the founding of the Trinity-Pawling Athletic Hall of Fame. The Athletic Hall of Fame honors former teams, student-athletes, and coaches who have reflected honor upon Trinity-Pawling School by virtue of outstanding performance and exemplary contributions to their alma mater, community, and profession, and in doing so, reflect the philosophy of a college preparatory education and the ideals of sportsmanship. Front row: Leon Baker, Floyd R. Rutherford, Richard H. Hilmer (Captain), Kevin C. McGrath (Captain), Mark D. Fitzgerald, Missing: Sinclair W. Kinsey (Manager). 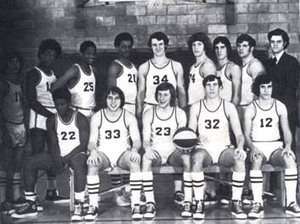 The Trinity-Pawling 1973 Varsity Basketball Team earned distinction with a perfect 18 - 0 regular season record. Trinity-Pawling: Varsity football, basketball, and track; Captain of track and basketball; President of Student Council • Yale: Varsity track and member of IC4A championship team • US Navy: Sea duty; reservist for thirty years; retired Rear Admiral; awarded Legion of Merit; recipient of Secretary of Navy and New York State awards for work on behalf of US Navy • Advertising and network television executive; adjunct associate professor at St. John's University • Free-lance writer on travel, business, and military topics. Trinity-Pawling: Varsity football, basketball, and baseball; Captain of football and basketball; Prefect and Vice President of student council • Harvard: Varsity football, basketball, and baseball; President of the Harvard Varsity Club; recipient of the Harvard Club of New York Thomas Slocum Award; member of numerous alumni and athletic committees • Founder and President of the Haughey Company, Inc., Boston • Board member of many community organizations in Boston area. 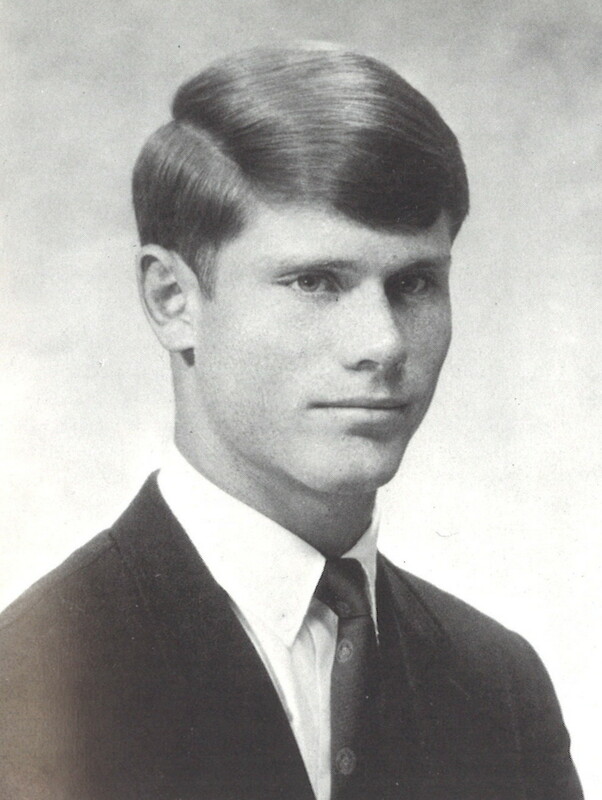 Pawling School: Varsity track, football, basketball, and golf; Captain of track; school record in the high hurdles, broad jump, and high jump; high jump record held for 80 years; Senior Prefect and President of class • 1912 and 1916 U.S. Olympic Team member; high jump Gold medal winner in the 1915 British Games • Yale University: Captain of track • Pilot in the U.S. Army Air Force • NCAA official in track • Trustee of the Pawling School • Director of Public Relations at General Motors Overseas Division • Accomplished golfer; active in the Episcopal Church • Died in 1980 at the age of 88. In the spring of 1969, Trinity-Pawling fielded its best lacrosse team in the 11 years since the sport was introduced at the school. The 1969 Varsity Lacrosse Team finished the year with a perfect 12 - 0 record and was named the New England Co-Champions. First row: Scott S. Menzies '69, Mark B. Andruss '69, Emlen M. Drayton '69, Eric L. Bergland '69, Richard A. Jamison, Jr. '69, Philip G. Kee III '69, George B. Brush '69, Robert C. Ream II '69, Paul L. Sturz '69, William P. Shannon, Jr. '69, David E. Currie '69. Second row: Coach David A. Jollin '64, Jay F. Bresnehan '71, Michael W. Tandy '70, Jonathan E. Pettit '70, Wolcott H. Outerbridge '70, Duncan C. Tenney '70, Alan E. Anderson '70, Stephen P. Heath '70, Harry P. McGinley III '70. Back row: Coach J. William LaBelle, Jose A. Fernandez '69, James R. FitzGerald '69, Jon S. Thompson '69, Kenneth E. Knowles III '69, Samuel B. Skinner III '69, Thomas G. Richards '69, Thomas J. Gilmour III '69, S. Randall Goat '69, William C. Shattuck, Jr. '69, William W. Kelly '69. 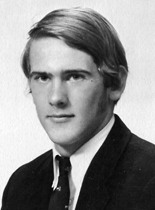 Trinity-Pawling: Varsity football, basketball, and baseball; Captain of basketball; Prefect and student council • Brown University: Varsity football, and lacrosse; freshman basketball; holder of various punt and kickoff return records and honorable mention All Ivy League in football • Trinity-Pawling teacher and coach, 1968-1971 • CEO and Chairman of Willis Corroon Corporation of Massachusetts • Board member of two private schools; youth soccer and basketball coach. 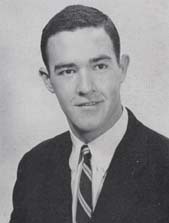 Faculty member at Trinity-Pawling, 1949-1975 • Graduate of Clark University in 1942: Captain of baseball and basketball • Professional baseball in the St. Louis Cardinal's farm system for one year • U.S. Navy, 1944-1946 • Faculty member at Newark Academy and Lawrenceville, 1946-1949 • Head of the Science Department at Trinity-Pawling • Head Coach of football, basketball, and baseball at Trinity-Pawling: Numerous undefeated and championship teams in all three sports • Long time favorite of many alumni • Director of Long Lake Lodge, a tutoring camp in Maine • Died in 1992. 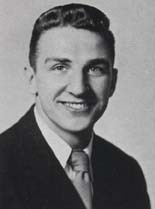 Pawling School: Four year student; football, basketball, and track • U.S. Army Air Force, 1943-1946 • Michigan State: Lettered as a fullback in football, 1946-1949 • Football coach and Athletic Director at Hillsdale College, 1954-1973; 138-46-5 coaching record at Hillsdale • Head Football Coach, Michigan State, 1980-1982 • Accomplishments: NAIA Football Hall of Fame, Michigan Sports Hall of Fame, Hillsdale College Hall of Fame, National College Football Coaches Hall of Fame, President NAIA Football Coaches Association • Active in the Big Brothers of America, Boy Scouts, and the YMCA. Trinity-Pawling: Captain of football, hockey, and baseball teams • Harvard University: Nine letter winner in football, hockey, and baseball; Captain of football; named Harvard's Greatest Living Athlete in 1998; All-American and MVP in Eastern Football; 1953 Bulger Lowe Award as New England's Outstanding collegiate football player; 1998 Massachusetts Distinguished American Award; First line hockey player for three years; Selected to the College All-Star Hockey Team and was on the cover of the 1954 Official NCAA Ice Hockey Guide; Catcher on the baseball team for three years • U.S. Army, 1955-1956 • President of the Davenport-Peters Company • Board member of the Friends of Harvard Football, the Harvard Stadium Club, the Massachusetts State Police Youth Olympics, the Boys and Girls Club of Boston, and the Massachusetts Hospital School; Coached bantam and pee-wee hockey. 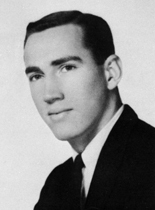 Trinity-Pawling student, athlete, prefect, 1954-1957 ¨ Varsity letterman for football, basketball, baseball, track ¨ Annual Award for Most Valuable Player - football and track, 1957 ¨ Middlebury College - B.A., 1961 ¨ First Lieutenant, United States Army, 1962-1964 ¨ Honorable discharge, Captain, United States Army Reserve ¨ Trinity-Pawling teacher, mentor, coach, 1964-2001 ¨ Coached varsity football, baseball, and lacrosse ¨ Led basketball team to 11 Tri-State League Championships with a winning percentage of .700 ¨ Western Connecticut State College - M.A., 1975 ¨ Coached Trinity-Pawling basketball team to its first New England Championship, 1994 ¨ Athletic Director, 1973-2001 ¨ Director of Trinity-Pawling Annual Fund and Advisor to Development Office. New England Champion 600 yard run and Massachusetts Champion 880 yard run, Arlington Massachusetts High School, 1954 • Second Team All American in lacrosse North-South Game, University of Massachusetts, Amherst, 1958 •Trinity-Pawling teacher and coach, 1958-1973 • Started wrestling and lacrosse programs at Trinity-Pawling • Coached soccer, wrestling, and lacrosse • Led the 1969 lacrosse team to the New England Championship (Hall of Fame Inductees, October 9, 1999) • Assistant Athletic Director at Trinity-Pawling, 1963-1964 • Athletic Director at Trinity-Pawling, 1964-1973 • Coach of the North Team USCLA North-South All Star Game, 1974 • Assistant Headmaster, Coach of soccer and lacrosse, Wilbraham and Monson Academy, 1973-1988 • Headmaster, Coach of soccer and lacrosse, Winchendon School, 1988-present. Pawling School student, athlete, senior prefect, 1929-1934 • Class President • First Pawling student to earn seven varsity letters - baseball, basketball, football, hockey, soccer, swimming, and track • Tied school record for 100-yard dash (10 seconds) and set Pawling School record for 440-yard run (50 seconds), 1934 • Member of Dartmouth College's record setting 2-mile relay team • Dartmouth College - B.E., 1938 • Counter Intelligence Agent, United States Army, 1944-1946 • Interpreter for French president-elect, Charles de Gaulle, during 1945 United States visit • Marketing and Advertising specialist for many major United States corporations, 1938-1971 • Bought and produced television shows including "I Love Lucy" and "Candid Camera" • Commercial/Investment Realtor, Real Estate Counselor, 1972-present • Civic volunteer, church trustee, police chief, city trustee • Board Member, The Healing Place, Louisville, Kentucky. 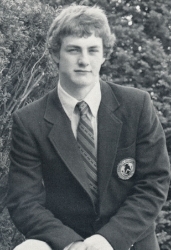 The 1979 Varsity Hockey Team enjoyed the most successful season ever experienced by a Trinity-Pawling hockey team. Through hard work and determination, the team compiled a record of 18-1-1, outscoring their opponents 91 to 45. The highlight of the season was capturing the Housatonic League Championship for the first time. The team did it in grand style by sweeping the league with an 8-0 record. Trinity-Pawling student, athlete, prefect • Captain and Varsity letterman for soccer, wrestling, and lacrosse • Leading scorer for lacrosse • Hobart College - B.A., 1987 • Four year member Hobart Varsity Soccer Team • Soccer Captain, MVP Senior Year • Hobart Varsity Lacrosse mid-fielder - Four National Championships, Division III • Scored 6th & 7th goals in Hobart's 1987 win (9-5) over Ohio Wesleyan in the National Championship Game • Eagles Eye Lacrosse Club, 1988-1993 • Merion Cricket Soccer Club, 1988 - present • Radnor Elite Soccer Club • National Finals 1999, United States Amateur Soccer Association • CHA Enterprises, Director of Sales and Marketing • Eagles Eye Clothing Company, National Sales Manager. Three year student at Trinity-Pawling • Varsity letterman for soccer, hockey, and baseball. Leading scorer in soccer and hockey, undefeated as a pitcher in baseball • University of Vermont. Varsity hockey and baseball. All-American, captain, and leading scorer in hockey. 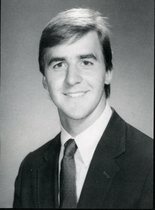 Finished second for the 1982 Hobey Baker award (College Hockey Player of the Year) and first college player selected in the NHL draft in 1981. 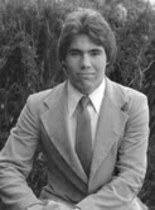 1981-1982 All-American and all ECAC Player as a pitcher in baseball •Professional hockey, AHL, 1983-1984 • Began 12 year professional baseball career with the California Angels organization in 1983 and traded to the Chicago White Sox in 1992. Won 106 games as a major league pitcher with over 1,000 strikeouts. Best season in 1986 with a 17-10 record and a 3.36 ERA • Inducted into the University of Vermont Athletic Hall of Fame in 1993 and the Canadian Baseball Hall of Fame in 2003. 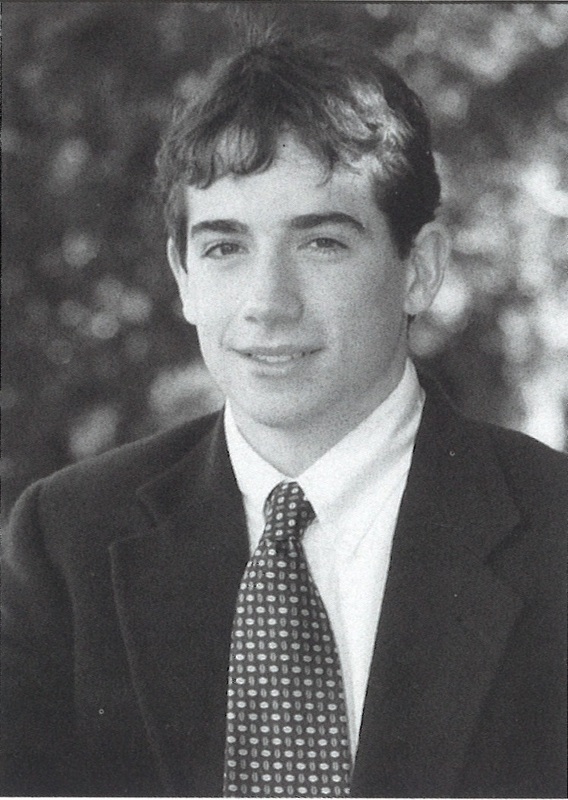 Four year student at Trinity-Pawling ¨ Prefect and earned 12 varsity letters in football, basketball, and baseball. Captain and MVP in all three sports ¨ Entered Seton Hall University in 1986 on a Division I Scholarship for baseball. All-American and holds Seton Hall's record for HR's (57) and RBI's (218) and a .417 batting average for three years. Named Big East Player of the Decade ¨ Selected by Boston Red Sox (1st round pick) in 1989. Major league debut in 1991 which included playing with the Anaheim Angels and New York Mets over a 13 year career ¨ During 8 years with the Red Sox, Mo averaged over .300 hitting with 31 HR's and over 100 RBI's per year. 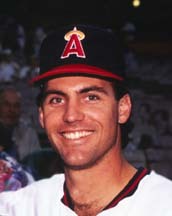 Named to the American League All-Star Team in 1995 and 1996. The American League Most Valuable Player in 1995 when he hit .300 with 39 HR's and 126 RBI's. Best year, 1996 - .326, 44, 143 ¨ Inducted into the Seton Hall Athletic Hall of Fame in 2001. Awarded honorary degree from the New England School of Law. 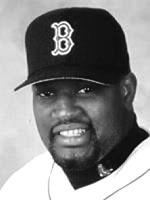 Founder of the Mo Vaughn Youth Development Program in 1994. Faculty member at Trinity-Pawling, 1950 - 1977 • Served in the US Navy during WWI • Graduate of Harvard University • At Trinity-Pawling taught English, Spanish, German, French and Latin and served as Director of Studies and Alumni Activities • Trinity-Pawling's head hockey coach, 1950 - 1955 • Secretary of the NCAA Rules Committee and writer of the National Hockey League Rulebook • Member of the US Hockey Committee at the 1948 Olympic Games • Elected to the Hockey Coaches Association in 1962 • Trinity-Pawling Hockey Rink named in his honor in 1966 • Died in 1977 at the age of 80. 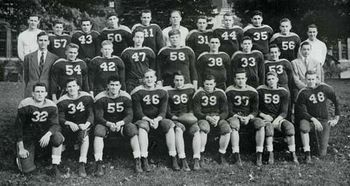 The members of the 1949 Varsity Football Team distinguished themselves with an undefeated season • Recognized as one of the outstanding prep school teams in the East • Outscored their opponents by 185 - 33 • Top offensive and defensive team in the area. 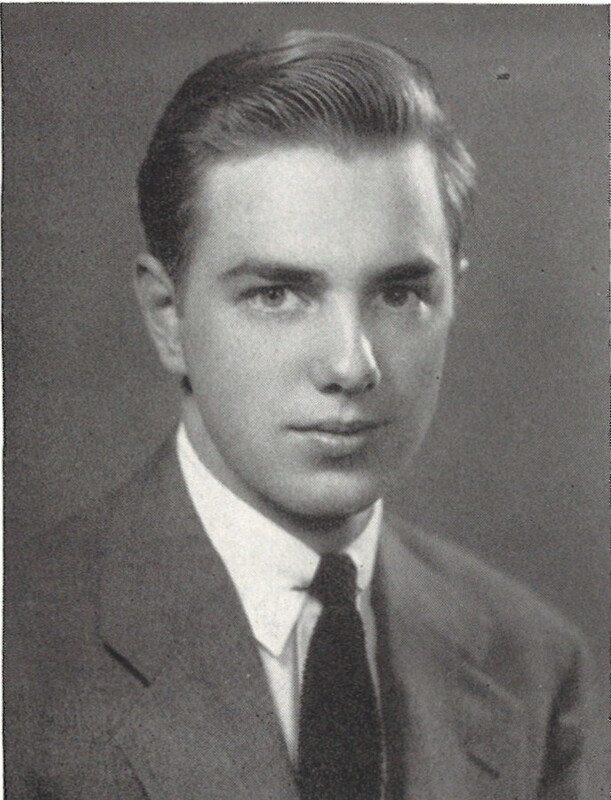 Student at the Pawling School, 1940 - 1942 • Senior Prefect, Class President, and Chairman of the Athletic Association • Captain of varsity football, varsity basketball and varsity baseball, all of which were undefeated • Graduate of Union College, 1942 - 1948 • At Union College, Little All American and captain of football, co-captain in baseball and played varsity basketball • Signed a contract with the Detroit Lions; career shortened by military commitments • In 1942, enlisted in the US Army and served in seven combat zones during WWII • Recipient of the Bronze Star with Cluster, Purple Heart, Combat Infantry Badge, and Presidential Citation as a member of the 36th Infantry Division. • In 1979 honored as the "Citizen of the Year" by the Chamber of Commerce in Clarence, NY. 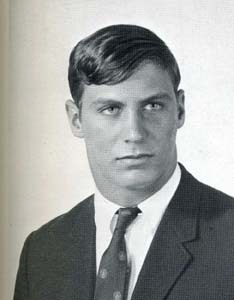 Student at Trinity-Pawling, 1965 - 1969 • Prefect and Student Council member for three years • MVP varsity football, varsity wrestling, varsity lacrosse • 1973 graduate of St. Lawrence University • Co-captain of the varsity football team and captain and MVP of the St. Lawrence lacrosse team for two years • President of the SAE Fraternity in college • MBA degree in 1981 at Loyola College • Successful business career in Maryland • President of the Terminal Corporation and Managing Partner of BalTerm, LLP • Recipient of the Governor's Award for Trade Excellence and the Maryland Award for International Business Leadership • Member of two school boards and various organizations including Maryland's World Trade Center Institute, The Maryland Chamber of Commerce, The Baltimore Advisory Council to the United States Small Business Administration and the Governor's Advisory Committee of the Office of Children and Youth. Board member for the US Lacrosse Foundation. 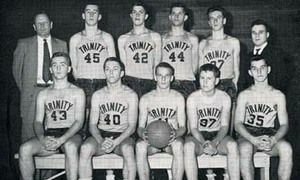 The 1957 Varsity Basketball Team had a remarkable season finishing with a 19 - 1 record which was the best in school history • Tri-State League champions • Clearly recognized as the top team amongst New England prep schools • Outstanding student athletes who matriculated to colleges such as Middlebury, Princeton, Stanford, Trinity, and Williams. First row: Robert J. Myslik '57, Miles H. Hubbard, Jr. '57, Keith W. Donohoe '57, John B. Minner '58, Stephen Le Gost '57. 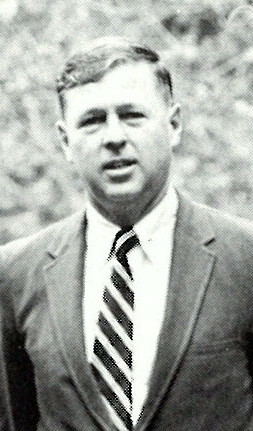 Second row: Coach Jack Karpoe, James B. Van Hoven, Sr. '58, William P. Scully '57, Captain, Bruce W. Anderson '57, G. Fraser Casey, Jr. '58, Stephen B. Annis '57, Manager. 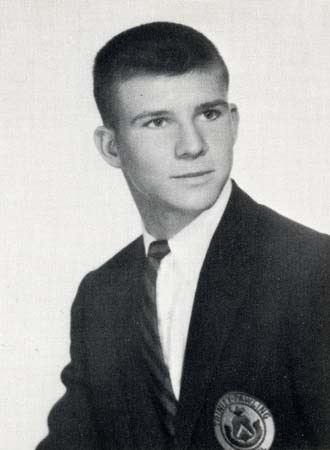 Student at Trinity-Pawling 1958 - 1962 • Captain Varsity Tennis, MVP Varsity Soccer, Varsity Basketball • Undefeated in tennis 4 years • Ranked # 7 boys tennis player in Eastern Lawn Tennis Association (USTA), 1960 • Recognized as one of the foremost soccer lineman in the league • President of the Glee Club; soloist and leader of the Trinitones, 1962 • Miami University, Oxford, Ohio - # 1 tennis player • Singles finalist - Mid-American Conference Championships, 1966 • Graduated 1967 and member of Delta Upsilon • USPTA certified professional tennis instructor; Wee Burn Country Club, Darien, CT and Lake Kendall Tennis Club, Miami, FL. • Director of Tennis, Fort Myers - Lee County YMCA, Fort Myers, FL, 10 years • Weekly tennis instruction TV program on NBC's Southwest Florida affiliate WBBH, 1976-1978 • Responsible for bringing women's tennis tour to Southwest Florida, 1976-1979 • Retired from active professional tennis, 1980 • Vice President, Fort Myers real estate firm, 5 years • Teacher, soccer, tennis and golf coach, 23 years, Lee County School System, Fort Myers, FL • Three time recipient of "Who's Who Among America's Teachers" • Retired from active teaching and coaching, June 2008. Although the 1990 Varsity Track season had a record of 3-5, the team of "eight" won the Division II New England championships and the Founders League for the season. Spurred on by the tri-captains, Darran Bornn, Ed Miller, and Paul Miranda, the squad took the competitors by surprise at the New England's with five first place wins; five second place wins; one third place win; one fifth place win; and one sixth place win. Darran Bornn, Ed Miller, and Paul Miranda, received the Annual Award and Ramon Felix received the Coaches Award for the season. Left to right: Coach Clifford H. Mark, Christopher R. D. Cattani '93, Jonathan M. Kurian '92, Paul A. Miranda '90, Captain, Darran M. Bornn '90, Captain, J. Edward Miller, Jr. '90, Captain, Ramon A. Felix '90, John G. Lynch '91, Charles L. Stockwell '91, Coach Mark G. Gartner. 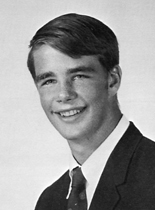 Trinity-Pawling student 1966-1970 • Recognized as "Best Athlete" throughout Trinity-Pawling career • Varsity Football, Captain Varsity Hockey, Varsity Lacrosse, Varsity Tennis • President of the Varsity "T" Club and recipient of the Father's Association Award in football • Member of Junior National Hockey Team • Entered Boston University in 1970 • Captain of Freshman Hockey, Varsity player for three years • Member of numerous championship and tournament teams: NCAA, ECAC, Beanpot Tournament • Post college - property of NHL Washington Capitals • Played one season with AHL Richmond Robins • Professional career involved with sports industry • 1978-1992, Vice President of Development for New Boston Garden Corporation, Inc. • Resides in New Hampshire and active in numerous civic and private organizations. 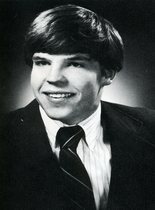 Student at Trinity-Pawling 1972-1975 • Named "Most Popular" in senior poll • Varsity Soccer, Captain Varsity Hockey, Captain Varsity Lacrosse • All-Western New England, All-New England, All-American in Lacrosse in 1975 • First All-American in Trinity-Pawling history • Played hockey and lacrosse at Clarkson University in 1976 • Degree from West Texas A&M University • 1980-1988 worked in television as Assistant Sports Director • Assistant Athletic Director and lacrosse coach at SUNY Canton, New York and assistant hockey coach at Clinton, New York Community College during early 1990's • Has earned two master degrees • 1995 to present, Library Media Specialist in the Peru, New York school system • Interest and hobbies - reading and researching local history, hiking, and wildlife. 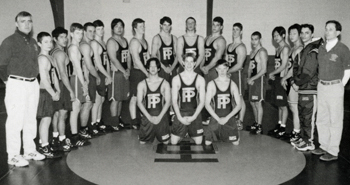 The 1997 Trinity-Pawling Wrestling Team consists of two teams, the 1996-1997 and the 1997-1998 seasons. Over the course of these two years, the team had two perfect seasons, winning a total of 35 matches. 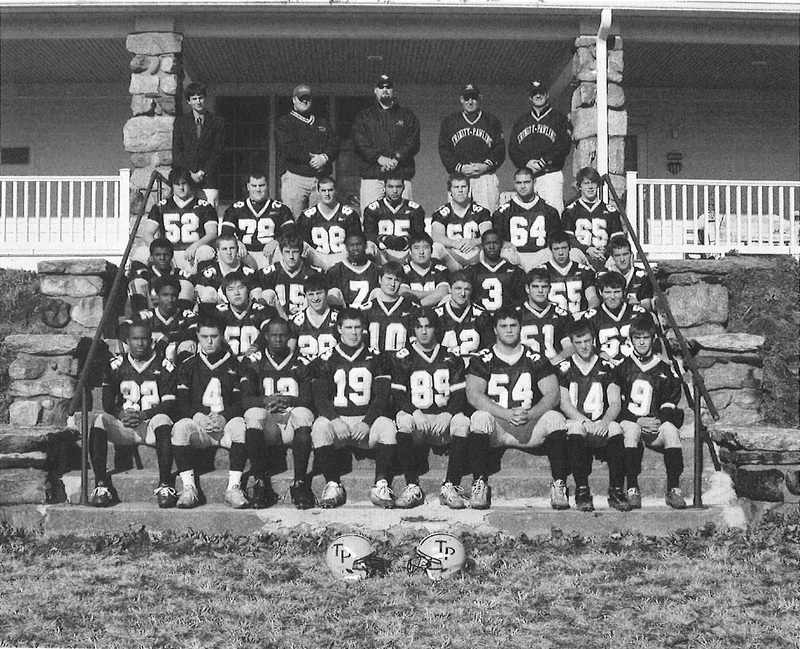 Led by Head Coach Dave Coratti and Coach Bill Dunham, the team earned the distinction of the 1997 and 1998 Founders League Champions and 1997 and 1998 Western New England Champions. Standing: Coach David N. Coratti, Renato C. Antolini '97 (Manager), William M. Diefenderfer IV ’97, Harold A. Reinauer II '97, Jason D. Romanello '97, Gregory B. Howe '97, Michael J. DeNardo '97, Timothy C. McCabe '97, David E. Rothermel '99, Jesse H. Wildrick '98, Nicholas B. Forstmann '98, John P. Geehreng '98 (Manager), Coach William S. Dunham. Standing: Coach David N. Coratti, David T. Easton '01, Michael E. Dell '98, Timothy L. Bosch '01, Nicholas B. Forstmann '98, David K. Leopold '00, Yong Jae Chung '00, Peter G. Appel '99, David E. Rothermel '99, Jesse H. Wildrick '98, Joseph A. Califano '99, John B. Ferrarone '98, Thomas DeFonce, Jr. '01, Ronald D. Kim '98, Jin-Mo Chung '00, Anthony W. McMellon ’00 (Manager), Coach William S. Dunham. 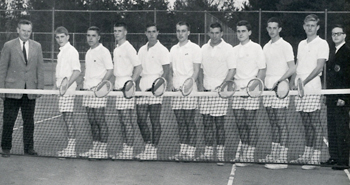 The Trinity-Pawling Varsity Tennis Team compiled one of its most successful records in 1961. Coached by Mr. Manifold, the net-men achieved a 9 and 0 record, making it the second undefeated season in the School's history. From left to right: Mr. Huber S. Manifold, C. Glen Dugdale '62, William K. Smith '61, David C. Hill '62, George S. Shelley '61, William H. Cluthe '61 (Posthumously), William L. Cartier '61, H. Carl Sturcke '61, Robert R. Stroud, Jr. '61, Hamilton J. Whitlock, Jr. '61, Richard Foxhall (Manager). 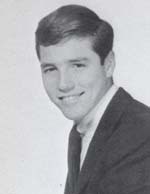 Student at Trinity-Pawling 1965-1969 • Prefect • Student Council, Varsity "T" Club, Sports Editor of the Trinitannus • Recipient of 10 Varsity Letters in Soccer, Wrestling, and Lacrosse • Undefeated in Wrestling, senior year • Captain of Varsity Lacrosse • Lead scorer junior and senior years • Selected to the All-League Team junior and senior years • Member of the 1969 Varsity Lacrosse New England Championship Team • Father's Association Award winner for lacrosse • Attended the University of Virginia • 4 year lacrosse player • Two National Championships, 1970 and 1972 • Leading scorer senior year, 1973 • Third Team All American Attackman • 28 years at Active Mineral International as Director of International Logistics. **Rick Bergland passed away on April 9, 2012. He is survived by his wife Annie, and three daughters Brita, Eleanor, and Emily. 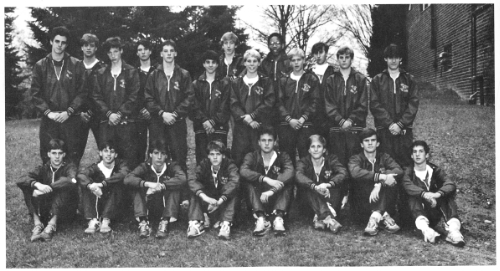 The 1987 Trinity-Pawling Varsity Cross Country Team compiled one of its most successful records in the fall of 1987. Coached by Cliff Mark, the Cross Country Team finished 12-0 in the regular season. “The season’s undefeated record of 12-0 illustrates the closeness, dedication, and intensity that the team displayed throughout the season.” The team finished second out of 17 at the Canterbury Invitational and finished third out of 20 at New Englands. Front row: William J. Bosanko ’88, Christopher M. Black ’88, Richard D. Kelly ’88 (Captain), Ian F. Boote ’89 (Captain), Marc A. Schwarz ’88, Stephen D. Hall, Jr. ’88, Daniel F. Beins ’88, Brian R. Stone ’88. Back row: Anthony D. Gates ’89, Benjamin C. Savage ’89, Jedediah Palmer ’89, Charles B. Atwill II ’88, Jeffrey K. Hartman ’89, Dylan T. Netter ’91, David F. Taylor ’90, Christopher L. Skelly ’89, Paul A. Miranda ’90, Peter Benyo ’89, Scott B. Galloway ’90, Daniel W. Scott IV ’90, Philip A. Norkeliunus ’89. 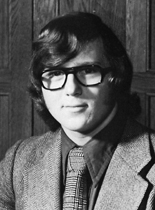 Over the course of two years, the 1972 and 1973 Trinity-Pawling Varsity Tennis Teams had two perfect seasons, winning a total of 21 matches, led by Head Coach Walt Adams. 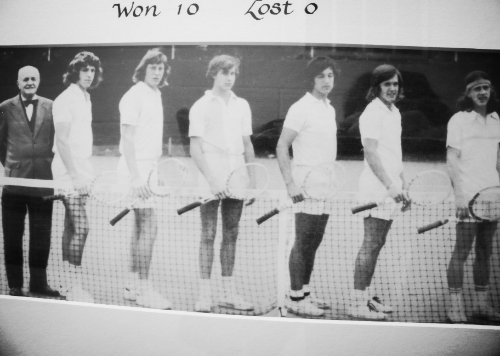 James W. Hilmer ’75, Richard H. Hilmer ’73, Peter A. Felske ’72, Coach Adams. Left to right: Coach Adams, James W. Hilmer ’75, Richard H. Hilmer ’73, Gary Squires ’75, Jeffrey A. Kronemeyer ’73, Thomas F. Ahrensfeld, Jr. ’73, Harrison W. Straley ’74. 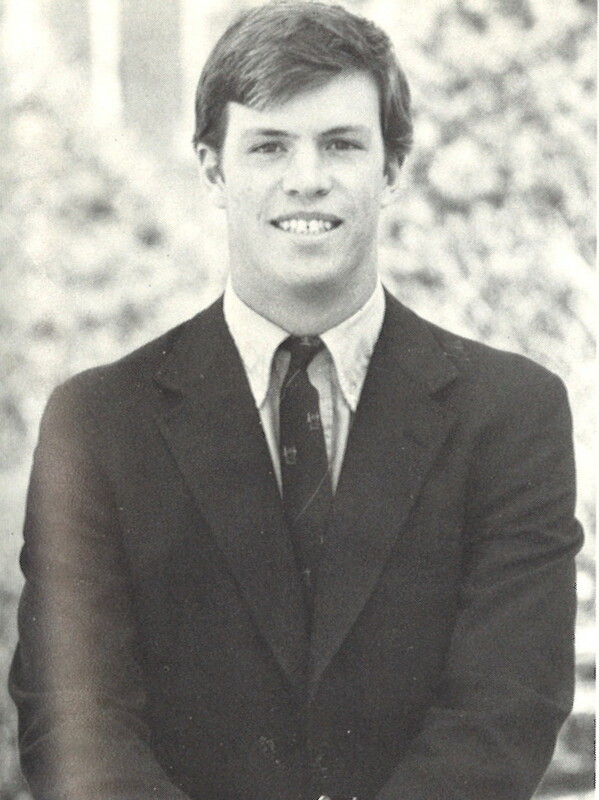 Student at Trinity-Pawling 1979-1983 ♦ Varsity Captain of three sports: Soccer, Hockey, Lacrosse ♦ MVP Hockey 1983 ♦ Head Prefect ♦ Named “Best Athlete” in senior poll ♦ Attended Bowdoin College ♦ Named ECAC Rookie of the Year in 1984 ♦ Named All – New England defensemen in 1985, 1986, 1987 at Bowdoin ♦ Earned All – American Honors in Hockey 1985, 1986, 1987 at Bowdoin ♦ Captain of Hockey team in 1987 ♦ Competed in three seasons of Varsity Lacrosse at Bowdoin ♦ Drafted by the Pittsburgh Penguins in 1987 ♦ Signed with Vita Hasten, Professional Sweden League ♦ Ten year professional career (25 goals, 42 assists) ♦ One son named Desmond ♦ Works as a computer consultant. 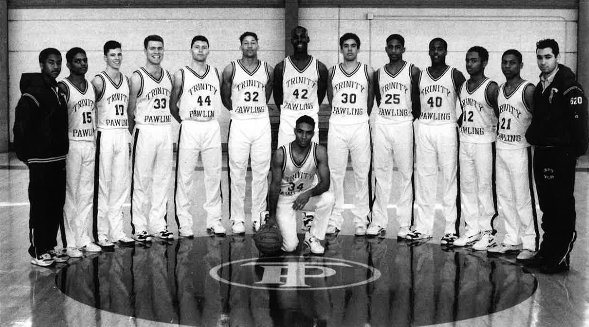 The 1993-1994 Varsity Basketball Team compiled its most successful season in history. The Basketball Team went 22-0, captured the Tri-State and Founders League Championships, as well as the Class B New England Championship. Coached by Miles H. Hubbard, Jr. ’57 and Christopher G. Kelly, Jr. ’81, the undefeated squad started the season off by defeating all their opponents in the Kingswood Invitational Tournament, the squad never looked back and went on to make history. Back Row: Darrell E. Rolle ’94, Manuel De La Cruz ’96, Paul J. Davis ’94, Raymond P. Garraghan ’95, Chad D. Brown ’94, Ivan N. Latimore ’94, Heshimu K. Evans ’94, Seth D. Lewis ’94, Khari D. Albury ’94, Harry Simmons III ’94, Kwam J. Martin ’95, Steffan P.G. Christie ’94. Row 3: Coach Jack Karpoe, Richard W. Grey ’65, Bruce W. Hopkins ’66, Mark M. Hughes ’67, Harold V. Carey ’65, Kent W. Comstock ’65, Gregory E. Bahret ’65, Theodore M. Riehle ’65, Keith D. Meistrell ’65, James A. Saldamarco ’65, Donald B. Hensley ’65, William Hartog III ’65, Richard G. Day III ’65, Coach William L. Steglitz, Coach Curtis E. Brown, Jr.
Row 2: Linden H. White III ’64, Russell M. Drumm ’65, Edmund Pfeifer, Jr. ’65, George R. Green ’65, Richard L. Wilson ’65, Louise E. Jallade III ’64, F. William Kervan ’64, Peter G. Dassler ’64, Thomas S. Smith ’64, Thomas L. Myslik ’66, John R. Erbeck ’64, C. David Eisler ’64, Kurt W. Jones ’66, Frederick S. Johnston III ’64, David L. de Milhau ’66, Robert E. Hughes ’64. Row 1: John T. Menzies III ’64, Samuel Allen Marshall III ’64, T. Richard Schlucter ’65, James L. Sanford ’66, Steven W. Kern ’64, Donald F. Textor ’64, Barry L. Brush ’64, Donald J. Masters, Jr. ’64, David A. Jollin ’64, Montague W. Demment II ’64, Bruce A. Mayer ’64, Richard A. Weber ’64, Kenper W. Miller ’64, Douglas E. Ebert ’64, Thomas H. Mayer ’65, Peter L. Betts ’64. 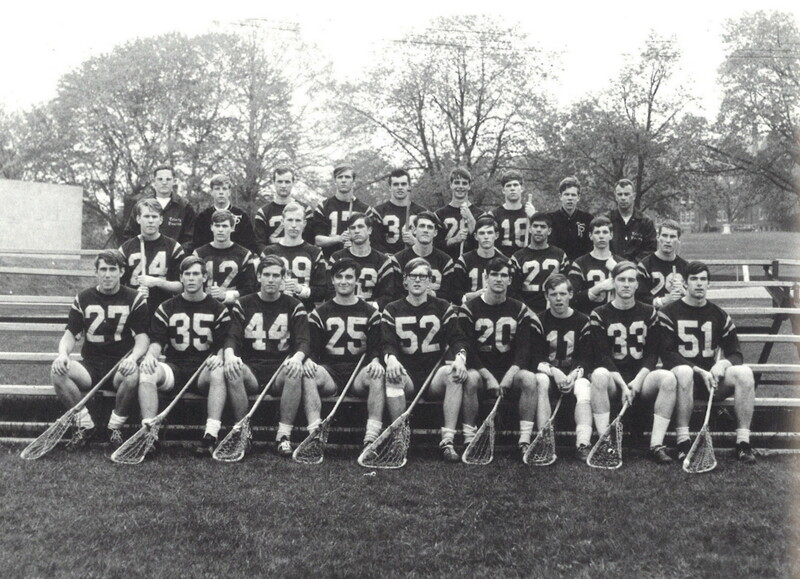 The 1967 Trinity-Pawling Varsity Lacrosse Team was undefeated, finishing the season a perfect 12-0. The team scored 140 goals throughout the season and allowed only 19, including 3 shutout wins. Led by a strong group of seniors and a handful of talented underclassmen, the ’67 Lacrosse team was undeniably one of the best lacrosse teams to ever take the field for Trinity-Pawling. 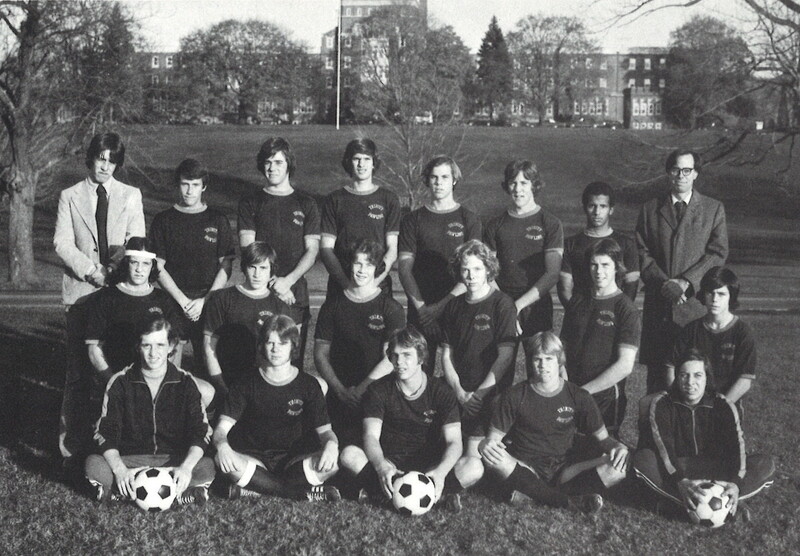 The 1976-77 Trinity-Pawling Varsity Soccer Team was one of the most successful soccer teams ever fielded by Trinity-Pawling, finishing the season with an 11-2 record. The team scored 47 goals throughout the season, most in the league, and posted 6 shutouts on the way to a 2nd place finish.